On January 11, 2011 at 4:27 P. M. a knock on my door; there stood two Harford County [MD] Sheriff's. They asked, "Do you have a son named Justin DeSha-Overcash?" I had barely gotten, "yes." out; the male sheriff quickly added, "Your son has been shot and killed." If you have never lost a child [or loved one] to Violence; no words I type will adequately explain what this moment has done to me. Hearing this nightmarish news; I went into denial. "No, No you're wrong; no, not my Justin, I'll call him you'll see." My son's cell rang and rang. I knew [then] the sheriff's spoke the truth; my son [my only child] was dead, How, why, when, who, where questions zoomed through my mind at an unbelievable speed. 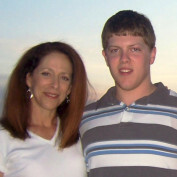 I could not grasp nor process my beautiful son MURDERED? Justin, 22 y.o., dbl major, at UMd [College Park], Physics and Astronomy/dbl minors Geophysics and Math, 4 months remaining until graduation beginning in 15 days. On Justin's death he possessed 176 credits and UMd awarded his diploma posthumously. The college also honored Justin with a scholarship to honor Justin's hard work and dedication, "The Justin DeSha-Overcash Summer Research Award". My son was murdered by a Prince George's County, MD career criminal wearing an ankle monitor received in DC for a Felony II Handgun Charge~22 days [before murdering Justin]. He was also on a parole violation for a 2009 charge in PG County, MD where he murdered my son. These career criminals [on the PG County CATCH & RELEASE PROGRAM] are standing beside you at cross walks, walking behind your child. Career criminals feel empowered, entitled; are YOU or a loved one NEXT? Justin saved 2 alumnus forfeiting his life THIS NEVER appeared in any media sources! I demand change in our Nations laws to protect us from career criminals who murder & destroy "all that is good, kind and beautiful". Justin said, "momma I keep you around because you get things done!"